Big Pit: National Coal Museum0300 111 2 333work Industrial HeritageBig Pit was a working coalmine until it closed in 1980. Then in 1983 it became a museum of the South Wales mining industry and on February 1st 2001 became incorporated into the National Museum and Galleries of Wales as the National Mining Museum of Wales. 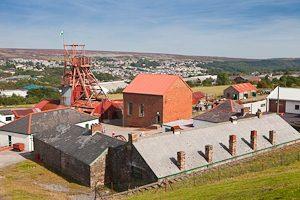 Big Pit was a working coalmine until it closed in 1980. Then in 1983 it became a museum of the South Wales mining industry and on February 1st 2001 became incorporated into the National Museum and Galleries of Wales as the National Mining Museum of Wales. On the surface you can explore the colliery buildings - the winding engine-house, the blacksmiths' workshop and the pithead baths where you can learn more about the story of coal and its extraction from below the ground.